Get ready for the best fun you’ve had all summer! Please arrive 25 minutes prior to departure to allow enough time for your little pirates to get their faces painted. Face painting and tattoos are included in the price. Skull-Danas and T-Shirts not included with the ticket price. The Sea Dragon leaves promptly at the scheduled departure time. Get professional pictures of your pirates aboard the ship. These photo keepsakes will be one you want to frame! 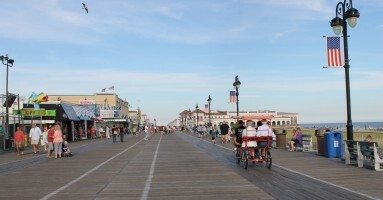 Purchase a gift certificate for loved ones who you know will be traveling to Ocean City, New Jersey. 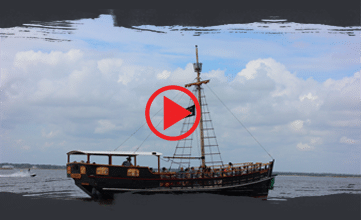 This is a once-in-a lifetime opportunity to experience the thrill of becoming a pirate! Individual or family gift certificates available. Choose any amount you wish to give. 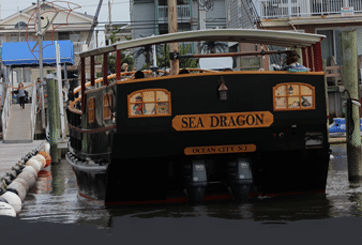 Private Charters aboard the Sea Dragon are perfect for field trips, birthday parties, family reunions and more. We have a Praise & Worship Cruise for Christians and a Sunset Cruise for those enchanted summer evenings! Small coolers are welcome on our sunset cruises. Birthday Parties aboard the Sea Dragon are a big hit with the kids! Make this a birthday to remember for a special child in your life. Visit the BIRTHDAY PARTIES PAGE to view special packages especially for these tours. Birthday parties are available ONLY on Saturdays and Sundays. We have an entire “pirate” retail store… from pirate skulldanas, t-Shirts, swords, daggers, Christmas ornaments, jewelry and other cool pirate products at our location. Visit us at 232 Bay Avenue, Ocean City NJ 08226.